Ashwin Willemse during his on-air walkout. He criticised the broadcaster’s bosses for stating the individuals involved were still engaged in an ongoing process, yet concluding there was no racism involved. A nationwide debate continued yesterday after a statement released by broadcasters SuperSport left unanswered questions, following a spat that played out between rugby presenters on live television at the weekend. 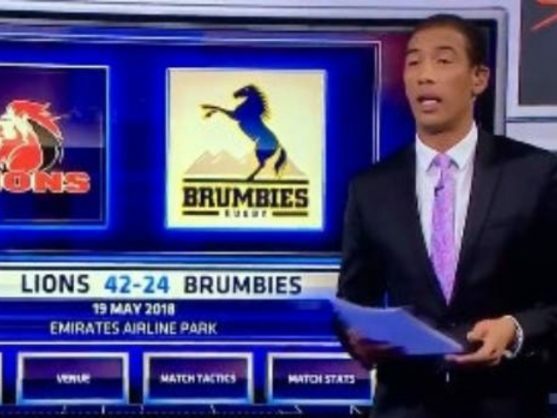 After meeting with Nick Mallett, Naas Botha and Ashwin Willemse, who walked off during the post-match analysis following a Super Rugby game on Saturday, the broadcaster said its investigation into the matter was an ongoing process and it could not comment on the discussion. It did move, however, to simmer public belief that some form of racism had led to the disagreement between the pundits. “There is no racism that we’ve picked up from any of the discussions that we’ve had … so as far as we’re concerned it’s people who got into some discussions of some sort, but we are still digging deeper into what really happened and transpired to lead to this type of action,” said SuperSport CEO Gideon Khobane. “Nobody walks off stage just for the sake of it. There must be something deeper and we are engaging all parties to get to the bottom of this thing. The public debate, meanwhile, is still being fuelled on various platforms. Yesterday morning, 702 talk radio host Eusebius McKaiser criticised the broadcaster’s bosses for stating they could not comment on details as the individuals involved were still engaged in an ongoing process, yet claiming it was already clear there was no racism involved. His comments sparked a heated debate between callers, while a widespread argument continued on social media. Though it was unclear what had escalated the incident, Willemse had seemingly been agitated by comments made by Mallett and Botha off air. The former Springbok suggested during the live broadcast that he had been patronised and undermined by his colleagues, lamenting that he had been “labelled as a quota player” during his career. Though Sport and Recreation South Africa (SRSA) did not respond to requests for comment yesterday after Sports Minister Tokozile Xasa called for Mallett and Botha to be suspended over the weekend, Xasa said in her budget vote speech in Cape Town that national quotas remained a critical issue in SA sport. Xasa said government would throw its weight into a court case opened last year by trade union Solidarity and minority support group AfriForum, which were fighting quotas that had been agreed upon between government and sports federations. “We are facing a court case by Solidarity, claiming that what we do is unfair to those who have held privilege since the dawn of colonialism and apartheid,” Xasa said.